Author: Gabrielle J. Melin, M.D. 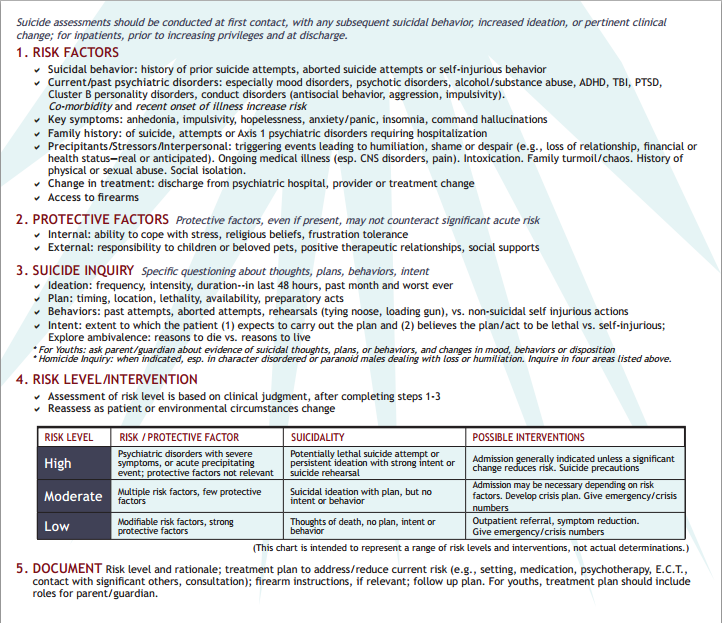 The skill of assessing for suicide is one that all Physicians should possess. This is in essence a Psychiatric code. Asking about suicide does not make patients commit suicide; this has been shown over and over again in studies. Just like a cardiologist listens to the heart and a Neurologists checks reflexes on all patients, asking behavioral patients about suicide is essential at each encounter. Yes, even ask the 85 year old farmer. They have one of the highest suicide rates of all populations. Start with basics like “Have you felt like life isn't worth living” or Have you thought of harming yourself?” With affirmative answers, dial down further to get more details. “Have you planned it?” “how close have you come to harming yourself?” Also ask what they would use, when and specifically how they would do it, etc. The more specific you are , the more information you will get. Tell the patient you ask everyone the same questions, so you normalize the process. None of us have a crystal ball, but we can do a good assessment. 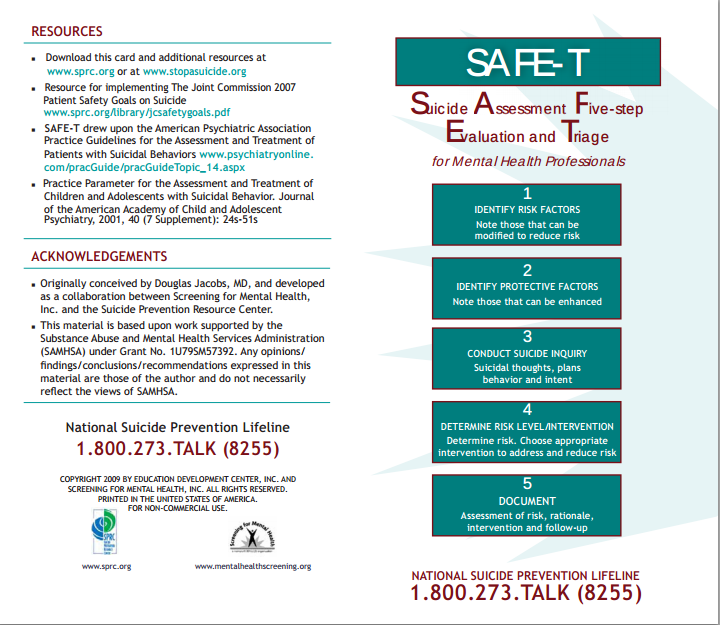 A Suicide Risk Assessment includes identifying risk factors, protective Factors and then overall Risk. Overall risk is low, medium or high. It is never zero. State the risk factors, protective factors and you overall risk in your documentation.Details and examples in chart below. Think about any risk factors that can be modified, i.e. gun access. Sometimes, there won’t be any risks you can mitigate and would, therefore, think more strongly about hospitalization. Being suicidal does not automatically mean the patient needs to be hospitalized. Do not write “contracts for safety” in your note. This statement alone will never hold up in a court of law. What is important is that you evaluate the patient, document your suicide risk assessment and take action if there is evidence of imminent risk. In the State of MN, this is the language used in the statute for criteria for a 72 hour hold. Check for the requirements in the state you practice in.